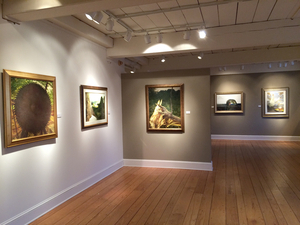 The Somerville Manning Gallery hosts a show of works by Jamie Wyeth through March 7. The exhibition includes old and new works. If you've been inspired by Jamie Wyeth's career-spanning retrospective at the Brandywine River Museum of Art – and plenty of visitors have been – you should take a 10-minute drive down Route 52 to the Somerville Manning Gallery in Greenville, Del. There, you'll find "Jamie Wyeth: Paintings From Six Decades." The show is admirably broad and diverse, with works that touch on most of Wyeth's cyclical artistic themes. The big plus is that everything's for sale, provided you have an unlimited budget. Browsing, however, is free. There's a charming watercolor study, "Pig," from 1969-70, that dates to the era of his iconic "Portrait of Pig" that's at the Brandywine. There' s a fine pencil and gouache study of Rudolph Nureyev (ca. 1977), just like the works you'll see hanging in Chadds Ford. And there's a dramatic 1969 watercolor of Apollo 11 on the launch pad, from Wyeth's days of depicting the space program. But the show isn't limited to smaller studies or sketches. There are major, landmark paintings as well. "Sunset, Southern Island" is a haunting, elegant oil of a girl in a lighthouse, gazing toward an unseen setting sun. The slanting light is just barely illuminating an iron fence and is seemingly trapped within the glass-enclosed structure, as if the sun has joined the sitter. Wyeth's strong affinity for animals is seen throughout the exhibit – perhaps most charmingly in "That Dog's House," a 2008 view of a smiling dog peeking out of a cupola that's been placed on the ground. A huge brown-and-white cow reclines in "And the Cow Jumped..." (2007), looking wistfully up at a sliver of a moon hanging in the sky. Seagulls take up residence under an antique chair and table in "Gulls of Monhegan No. 1" (1992), in which the beady eye and opened beak of one gull confront the viewer in warning. The gulls in "Strawberry Shortcake" are more confrontational, caught in a furious tangle over a plate of dessert. Similarly vivid emotions are caught in "Angry Chicken, Puzzled Duck" (2008). The combined fierceness and cuteness of geese is captured in "Former Nestling" (2012), in which a goose on a nest extends a neck toward an ungainly bird that's wobbling away on spindly legs, driven out to make its way in the world. The grim menace of three ravens against a swelling, dark sea make "Gulls Egg" (1988) a dramatic standoff. Wyeth has scribbled words ("Caw Caw," "Kahr") on the frame, putting you right into the scene. Elsewhere, the quiet resonance of "A Couple of Chairs Sitting Around the Coast of Maine" (1982) certainly suggests human characters who are represented by the ornate wicker chairs. The jagged, twisted shards of a shattered tree trunk in "Lightning Struck" (1974) stand out with nearly three-dimensional detail. Similarly, a huge, rusted saw blade in "Buzz Saw" (1969) exudes an air of danger. There's a wonderful air of stillness and contemplation in "The Pickup" (2008), as a man in a truck gazes away to an ocean horizon, with the green of his sunglasses mirrored in the window trim of the truck cab. Haunting, humorous, beautiful, and always unexpected, the exhibit sums up the appeal of Wyeth's long and uncompromising body of work. It's a perfect complement to the Brandywine River Museum of Art show. And if you spend some time poking around the gallery, you'll find heart-stopping original works by Andrew Wyeth and N.C. Wyeth, as well as a wide range of top-of-the-line art, old and new. The Somerville Manning Gallery (101 Stone Block Row, Greenville, Del.) will present "Jamie Wyeth: Paintings From Six Decades" through March 7. For more information, visit www.somervillemanning.com.